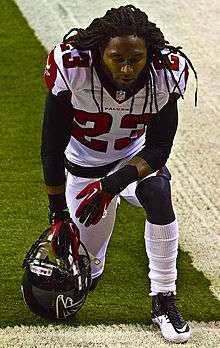 Willie Dunta Robinson (/ˈdɒnteɪ/ DON-tay; born April 11, 1982) is a former American football cornerback. He was drafted by the Houston Texans 10th overall in the 2004 NFL Draft. He played college football at South Carolina. Robinson also played for the Atlanta Falcons and Kansas City Chiefs. ↑ "NFL looks into Dunta Robinson's hit". espn.com. espn.com. Retrieved 19 September 2011. ↑ "Dunta Robinson Stats". ESPN Internet Ventures. Retrieved 16 May 2014.